Common Names: Torch Lily, Red Hot Poker, Rocket Flower. Mainly Southern African plants that grow in moist (sometimes very wet), peaty soils in the wild. In our gardens they need good rich soil, plenty of summer moisture but freer draining conditions in the winter. This is best achieved by digging in plenty of garden compost when planting and adding grit if your soil is cold and wet in the winter. Having tried out over 100 cultivars and species, I'd say as a general rule of thumb the narrower the leaf, the less winter hardy; so the ones with grass-like leaves (like Light of the World and Little Maid) need really good drainage and a warm sheltered spot. Kniphofia will grow pretty well in dry conditions but don't flower quite so spectacularly. All need full sun. The classic red / yellow "Red Hot Poker" is only one of the colour ways available: orange, yellow, cream, white, brown, green and shades between can be found. All change their colour as the flowers mature having the deepest shades in bud and fading to pale colours as the flowers open from the bottom of the inflorescence to the top giving the heads their characteristic bicolor appearance. Propagation is by division or seed. Named cultivars won't come true from seed and species will cross breed unless isolated. Plants will produce a few self seeds. Saved seed can produce good plants but the results from a single batch will be very variable, so its pot luck. Seed germinates well when fresh. Old seed rarely germinates. I've found its best not to cover seed at all, just press into the surface of the moist seed compost and give a little bottom heat if possible. This way seed can be sown in January and give good plants by summer. Plants are best divided when conditions are warm (even hot in mid summer) as new root is quickly grown at this time. Autumn divisions are likely to sulk and rot over winter. Kniphofia grow from woody rhizomes - the string-like roots don't form new plants. The rhizomes can be narrow and spreading and readily separate into new plants when dug up. Others are large and woody and need cutting up into sections using an old bread knife each with one or more leaf shoots or buds on them. I dead head by plants as the old flower stems can cause rots in the crown. Cut back first and then pull out the old stems when they are dry. 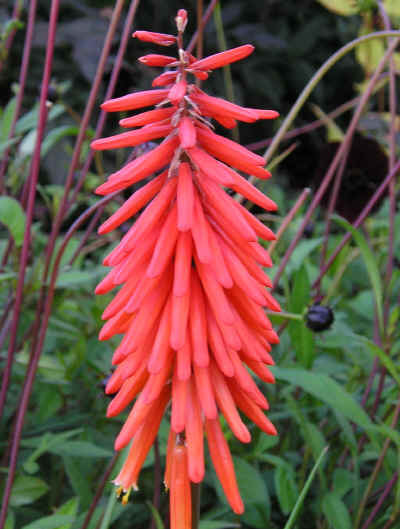 My Dad used to tie up the leaves of his Kniphofia in winter to keep wet from the crowns. I don't do this but it may be a good idea (Dad never lost his plants over winter on London Clay). I do find it is good idea to cut off the old leaves before the new ones get too long in late winter / early spring. This is a good opportunity to find snails and slugs hiding in the mounds of leaves and get rid of them. A member of the Asphodelaceae family. Rich yellow flowers on tallish plants with a flowering height of around 3ft 6in / 105cm. This is a very hard-to-get variety and stock is very limited. Bold green-topped, lemon yellow flowers in late summer. About 2ft 6in / 75cm tall. Originally from Arthur Bulley's Bees' Nursery. Our photo was taken at Ness Botanic Gardens which was created by Arthur Bulley. Bold fiery orange. A good strong and compact variety. Delicately coloured and slender flowers make this lady an elegant highlight of the border in July and August. About 2ft - 2ft 6in tall. Another very good red with flowers deep red at first, opening more scarlet. Flowers in September and is about 2ft - 2ft 6in tall. Uniquely coloured in pinkish orange. Short and stout - about 1ft 9in - 2ft. Flowers mid summer. Vey tough. Perfect Partners: What a great colour combination - Kniphofia Timothy with Lavender Grappenhall.